My name is Valentin and we share one common goal. To be a professional pilot. This means to actually earn a living doing what we feel the most passionate about. But to get there, my path, just like many others hasn’t been the most obvious. For starters, I am not originally from the United States. As a matter of fact I moved here in 2004 and at the time was working in the food business with degrees in marketing, international business and trade specialized in raw materials and equipments for high end food industries. I have worked for a cheese company in France, luxury hotels in the US and Canada and more recently for a very well known supermarket chain in the north-eastern US. While I love food and enjoyed working in this field I couldn’t seem to find enough satisfaction in my job, so I decided to look into a hobby I have always wanted to pursue. That’s right… aviation ! I didn’t know where to start, who to ask questions to, what to search for or even if as a foreigner I would qualify for a pilot certificate. Added to the situation was my bad eye sight which, in France would have made it impossible to fly for an airline even corrected with glasses ( I have since then invested in Lasik Surgery ). At the beginning to be honest, my thoughts didn’t go this far. I just wanted to fly on the side, to escape the monotonous work day of a regular job. Little did I knew that this decision to try something new would affect me for the rest of my life. I was lucky enough to have the moral support from my family which is a must but also to meet the chief instructor at Prior Aviation in Buffalo. I sent him an e-mail requesting information about flight lessons and he invited me to stop by the flight school where he took a couple of hours to meet with me and explain everything about getting a private pilot certificate. He is what I would consider a great mentor and a talented instructor. It took me about a year to finish the course while working full time, but only about 30 minutes in the Piper Warrior to realize that I was hooked and wanted to do it professionally. Then came the hardest decision of all. Fly for fun or fly for a living. I had to consider all aspects including financial or make choices like where would be the most suitable place for me to train. After a lot of research and spending a lot of time meeting people face to face or on forums, I decided to go to Delta Connection Academy ( now called Aerosim ) in Sanford, Florida. Delta Connection Academy is what you would call a “full time” flight school. At the time, in 2007, they were still owned by the legacy carrier Delta Airlines. They specialize in accelerated training from student pilot to multi-engine instructor and basic training for regional jets. I do not regret the decision. I felt well surrounded and guided by my instructors with whom I remain in touch to this day. I would say though, it’s a very costly decision. Overpriced ? Maybe. At equal certifications you could cut the bill by one third by going to your local flight school. But I found the academy to provide a great teaching environment with a learning center, real ground school, well maintained equipments and available, approachable certified ground and flight instructors. I acquired my Instrument rating and Commercial Multi and Single Engine certificate in about 9 months. By early 2008, I had decided to buy a block time in the Piper Seminole, a light twin, to gain more experience. It brought my total time to 300 Hours with almost half of it in a Multi Engine airplane that had taken me to the Carolinas, New Orleans or the keys. I felt on top of the world at the command of my four seat airplane like a 747 captain flying long hauls. Just like my peers, I thought being hired at an airline would be easy. After all they had been hiring pilots like me with minimum experience for a couple of years. The struggling industry and economy brought the hiring to a halt, hundreds of pilots on the streets and a striking reality check to newbies like me. I was left with another decision to make. Spend more money to gain my Certified Flight Instructor ratings and hopefully secure a position as an instructor at Delta long enough to ride the wave or find an alternate option. My first fear by following the instructor path was to be laid off after a couple of months because of reduced number of students coming thru the door. 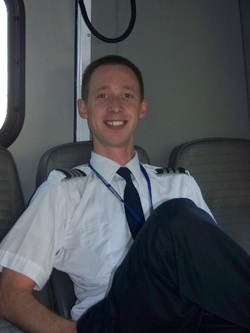 I was also worried that while gaining valuable experience, I would be part of a group of pilots with similar credentials and with nothing to separate me from them. I wanted to have an edge when the hiring would start again. With all that in mind, I started doing some research and evaluate all kind of options. I finally found a concept called first officer program. Basically you pay a company to let you sit on the right seat of their advanced airplane, yet where they normally only have one pilot operating them. With this option in mind I took the same amount of money that I would have used to train to be an instructor and contacted a company specialized in such program. I then was placed at Ameriflight, the biggest PART 135 freight carrier in the US, where after a rigorous training I was allowed to fly the Beech 99, a 14 seats turboprop converted to carry freight on behalf of UPS out of California. In a few months I had logged 350 more hours flying into remote airfields in Nevada or major airspaces like Los Angeles. I was on cloud nine but the airlines were still in a bad shape and I was running out of money…fast ! I had plenty of experience based on the hiring standards from the previous year but there were no lights at the end of the tunnel and certainly no plans for hiring or recalling of furloughed pilots. On top of that we all knew the minimums were going to skyrock to more than 1500 hours total time. Not such a bad thing safety wise but not so great for all the pilots trying to get a job and pay their bills. Luckily while I was seating at the headquarters between two flights, I noticed a posting for an opening as a First Officer on an Embraer 120. After 8 months in the company, I knew I had to ask my supervisor about it. I thought it would be out of reach but because I had proven myself while I was a time builder, they offered me the job and within a week, sent me to Atlanta to get my second in command type rating for the airplane. I had finally caught a break. Four weeks later, I was typed and ready to start my Initial Operating Experience, but most importantly I was happy to look back and appreciate all the efforts I had put and sacrifices I had done to achieve my goal. Two years later, I now have more than 2000 hours and I am ready to tackle the next challenge offered to me by American Eagle Airlines, where I am now flying the CRJ 700.